Hole-In-The-Wall Provincial Park is named after the resurgence spring which emerges from a limestone rock wall. This type of feature occurs when water travels underground through a complex series of caves and either works its way down to a level of impermeable rock or until it reaches the top of the water table. The water flow may then travel along the surface of the impermeable rock until it reaches the surface as a spring. This type of feature is usually associated with cave features, particularly where the predominant stone is limestone. Visitors to Hole-in-the-Wall Provincial Park will be amazed by the size and sheer volume of water. Surrounded by lush vegetation and a spectacular vertical blue-gray wall of limestone, this geological feature is impressive and easily accessible via a short 40 m walk from the road. Bring your own drinking water, as potable water is not available in the park. All surface water must be treated, boiled or filtered. Hole-in-the-Wall Provincial Park is located 50 km along the Sukunka Forest Service Road. The closest communities, towns and cities are Tumbler Ridge and Chetwynd. History - Hole-in-the-Wall Provincial Park was established as a Provincial Park in 2000. Cultural Heritage - The area has been traditionally used by First Nations of the Treaty 8 Tribal Association. 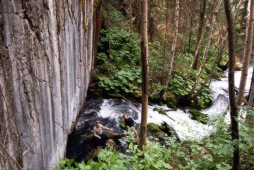 Conservation - Hole-in-the-Wall Provincial Park contains a resurgence spring that discharges from a limestone cliff located along the Sukunka River and near Windfall Creek in the Hart Foothills ecosection. The water flow changes with seasonal conditions. Wildlife - Moose, black bear, and mule deer are some of the species commonly observed in the park. Approved Purpose Statement and Zoning Plan [PDF 2.12MB] for Hole-in-the-Wall Park is available online in pdf format. There is a short 40 m hiking trail from the Sukunka Forest Service road to the spring. For your own safety and the preservation of the park, obey posted signs and keep to designated trails. Shortcutting trails destroys plant life and soil structure. Pets/domestic animals must be on a leash at all times. You are responsible for their behaviour and must dispose of their excrement. Backcountry areas are not suitable for dogs or other pets due to wildlife issues and the potential for problems with bears. At the end of the 40 metre trail, there is a rustic viewpoint area to observe the resurgence spring. Visitors wanting to observe the spring in the winter, can snowshoe the 40 metre trail. While campfires are allowed and campfire rings are provided at each campsite, we encourage visitors to conserve wood and protect the environment by minimizing the use of fire and using campstoves instead. Firewood can be purchased in the park or you may bring your own wood. Fees for firewood are set locally and may vary from park to park. Limited burning hours or campfire bans may be implemented. To preserve vegetation and ground cover, please don't gather firewood from the area around your campsite or elsewhere in the park (this is a ticketable offence under the Park Act). Dead wood is an important habitat element for many plants and animals and it adds organic matter to the soil.